Huawei hasn't really been in the tablet game for the past 18 months, but it's now looking to take on the budget end of the market. The Chinese firm has been holding back on its tablet assault, waiting for 4G to take hold in more countries, and now that it has we're getting the MediaPad M1 as well as the 7-inch MediaPad X1. Back to the MediaPad M1 and the 8-inch tablet is set to arrive in stores in May (with the choice of white or grey), featuring a not-too-shabby price tag of around £250 (about $415, AU$460). For that you're treated to a relatively average 1280 x 800 display, 1.6GHz quad-core processor and a surprisingly lowly 768MB of RAM. I'm used to seeing a minimum of 1GB in tablets these days, so I'm a little surprised Huawei has opted for less than that with the M1 and fear it may struggle to run more demanding applications. There's also a 4800mAh battery, microSD slot and SIM card tray squashed into a slender 7.9mm frame and the MediaPad M1 weights a manageable 329g, making it easy to hold and lighter than the iPad Mini 2 and Samsung Galaxy Note 8.0. Huawei reckons that battery will give you up to 150 hours of music playback, or enough juice to watch eight movies back to back - although I was unable to put this to the test. 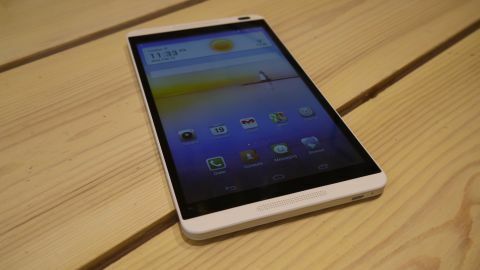 Look out for our in-depth Huawei MediaPad M1 review in the coming months for the full low-down on battery performance. As I've already hinted, the Huawei MediaPad M1 comes with CAT 4, 4G connectivity - the latest version - meaning you'll be able to get some super fast internet speeds if you're in a coverage area (and have a data SIM installed - which will require an additional monthly outlay). The MediaPad M1 also lets you make and receive phone calls and text messages, if you so desire. You'll be able to pick up the MediaPad M1 in a Wi-Fi only guise, and I'd expect this to be the tablet which hovers around the £250 mark, with the 4G version coming in slightly dearer. In terms of storage they'll be a choice of 8GB or 16GB, but considering the Android 4.2.2 Jelly Bean operating system and Emotion 2.0 UI take up 3GB you'll probably want to plump for the latter. I'm not a huge fan of the slightly childish appearance of Huawei's Emotion UI, and while it does keep things simple by completely removing the app draw, the whole experience doesn't exactly scream premium device. Looking at the MediaPad M1's design there's an air of the HTC One about it, with familiar looking, front facing speaker grilles laid out in the same fashion as the smartphone. Behind the drilled holes of the grilles the dual speakers are enhanced with DTS surround sound, although I was unable to test their quality during my hands on time. Huawei has managed to get an impressive screen-to-bezel ratio of 82%, meaning there's not a huge about of plastic surrounding the display - but there is enough to hold on to without fingers encroaching on the viewing area. The power/lock and volume keys are on the right of the M1 (when held in portrait), and are easy to hit, but don't be fooled by that metal looking rear - unlike the LG G Pad 8.3 the MediaPad M1 is all plastic. You can remove the bottom strip of plastic on the rear of the tablet to gain access to the microSD and microSIM ports, but that battery is locked away out of sight. The screen is passable, but the MediaPad M1 doesn't come close to the iPad Mini 2 in terms of detail or brightness, with colours appearing rather washed out. A short video clip I viewed on the tablet was watchable, but it's not going to blow you away with amazing graphics. The MediaPad M1 was sluggish as I moved around, opened and closed apps and fired up multi-tasking, but Huawei was keen to stress it wasn't running final software, so I'll reserve proper judgement for now. I also found the screen to be a little unresponsive at times, but hopefully that too will be ironed out before the final product goes on sale. I'm very much against people using tablets as cameras (you know who you are), but the MediaPad M1 comes with a 5MP rear snapper and a front facing 1MP lens. Neither will set the world alight, but they may come in handy on the odd occasion - especially the front option as it opens up the world of video calls. A cleaver trick the Media Pad M1 has up its sleeve is the ability to charge another device (such as your smartphone) via the microUSB port on the base of the tablet. You'll need to fork out for a special charging cable - the price of which is currently unknown - but I can see this being a helpful feature if your smartphone is on its last legs, yet the tablet in your bag still has plenty left in the tank. The Huawei MediaPad M1 is a solid 8-inch tablet, but it doesn't exactly excel at anything - if you want a cheap tablet the feature packed Nexus 7 would be a better option, although it does sport a smaller screen. Of course if you fancy a bit more screen real estate check out the G Pad 8.3, iPad Mini 2 and Galaxy Note 8.0. If those are out of your price range the Huawei MediaPad M1 is shaping up to be a decent affordable alternative - plus the option of 4G is a nice one to have.